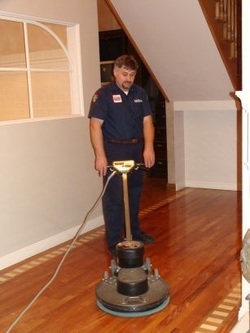 Palmetto Carpet & Floor Cleaning offers hardwood floor cleaning and recoating. Every hardwood floor that we clean is tested to insure compatibility with our cleaning agents. We use only Bona Hardwood Products. First the floor is thoroughly swept to remove loose particles. We then use a Bona power scrubber to apply cleaner, scrub, and extract dirt and solution. This will leave your floor clean and dry. Palmetto Carpet & Floor Cleaning also offers a recoat system to restore your hardwoods to the beautiful condition that they once were. Years of traffic, spills and normal wear and tear can cause your hardwoods to lose their shine and luster. We carefully test the floors to insure compatibility and adhesion .Our process includes adding a water born poly coating to revitalize your floors and bring them back to life.